Bukchon Hanok Village is a popular tourist destination located at the heart of Seoul, South Korea. The area is designated to preserve the local and traditional Korean way of life. Although it basically serves to introduce to guests the tradition, it is no longer how most Koreans live. 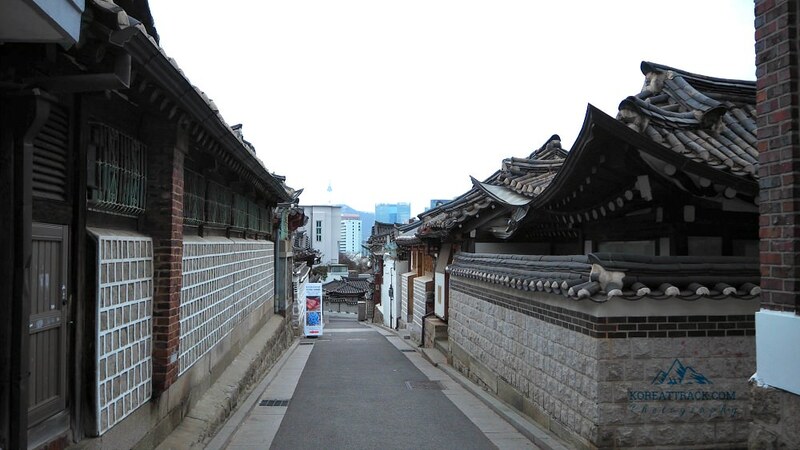 Bukchon Hanok Village is a walking distance from Anguk Station in Seoul. It is a busy area with a various array of shops—cafés, restaurants, art studios and shops, realty offices, among others. I want to introduce this place with the aim of telling you that there are some exciting things you can do here. This area is a famous site for Instagramers. 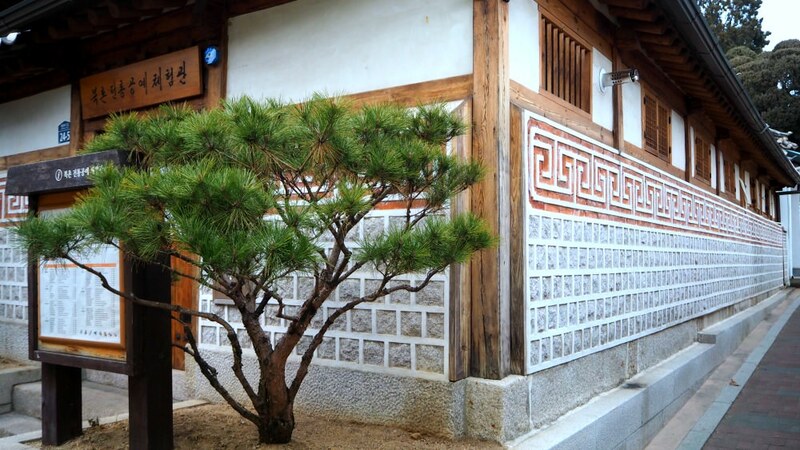 One among many reasons is that the village captures the watchers’ hearts of Korean soap opera of the Joseon Dynasty. The ‘hanok’ is the traditional Korean house build with environmental and natural resources available in their surroundings. For example, they used mud and hay to build the walls, and soil, mud, hay, lumber, wood sticks, among others to build the sturdy roof. 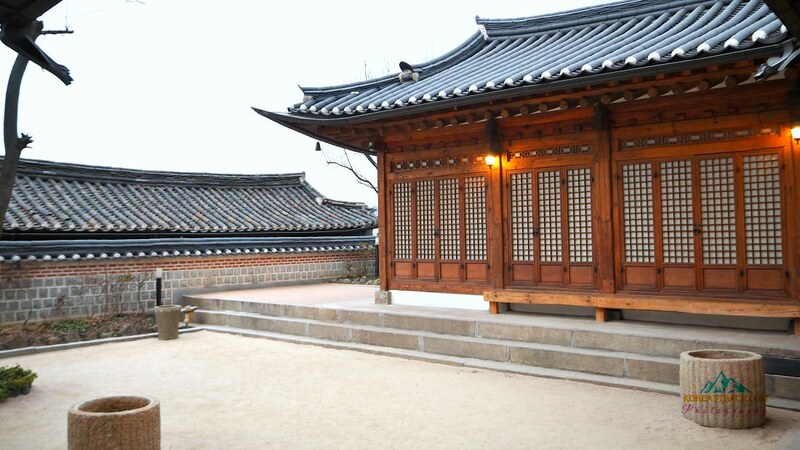 The hanok has low roofing to keep the temperature changes low. During summer time, it is cooler but not very cold either during winter time. To keep the residents warm during the winter season, Koreans heat the floor (called ‘ondol’) by building a steady fire under the floor. Where they build a fire for heating, they also cook food, heat water or boil potatoes. Nowadays, Koreans heat the floor (and the whole house or room), not by fire but mostly by water (or oil) that runs through the pipes laid out beneath the floor. So, when you visit this village, you will notice exhaust on the sides of each house and a place where they build a fire—most often, there is a huge cauldron on it. 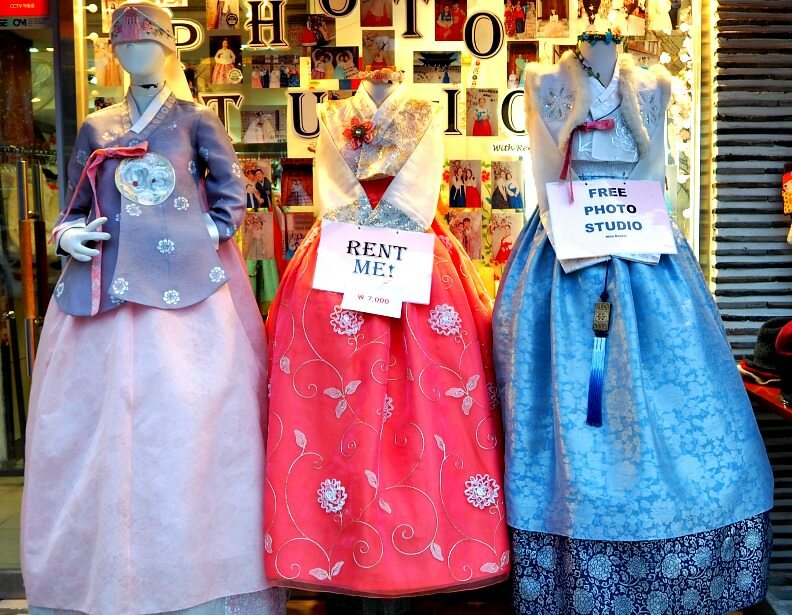 The second and quite interesting to see here is the traditional Korean ‘hanbok’s (clothing). Both the men and women’s clothes have vibrant and striking colors. Of course, the best ones are worn during special holidays and events (such as Chuseok, Lunar New Year, etc.). Normally, during their daily chores, the Koreans in the past simply wear the less colorful clothes except the kings and queens and the royal family members. 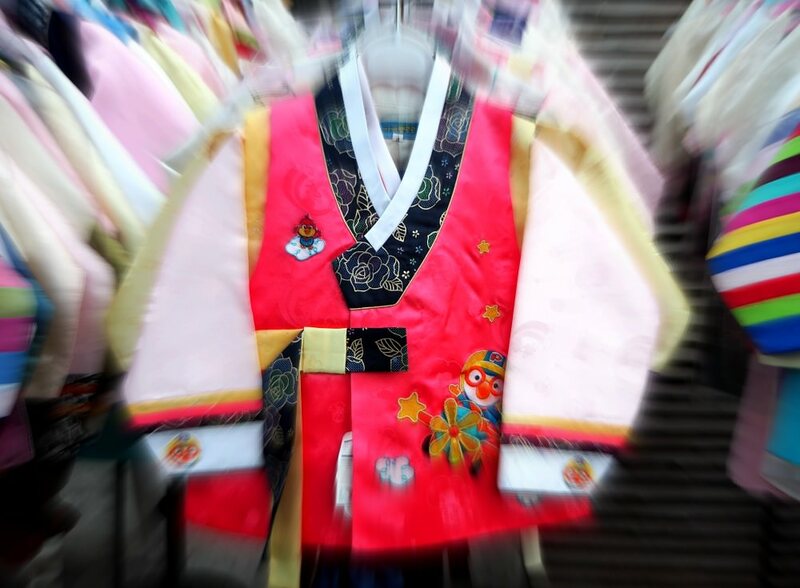 So, when at Bukchon Hanok Village, you can try wearing one of these traditional clothing. Now, feel like a royal complete with hanbok and headgear. Once you do it, it could mean you have completed your visit! Other striking items you will discover at this village are the displays of artistic works of artisans. Although things have changed from creating traditional to modern technological products, you will still appreciate their craftsmanship. You will see colorful textiles with various designs and the weaving machines around. Traditional paintings of birds and animals, handicrafts and furniture are strikingly pleasing to your eyes. To learn the craft of the Korean’s past craftsmanship, you have the opportunity to register in advance and learn the trade. If willing, you will learn the intricacies and secrets in creating such wonderful items by engaging in hands-on activities. If you are reading this in English, then you can join. That because they can only teach through a limited medium: English, Korean, Chinese, and Japanese languages. After exploring the traditional houses, you can purchase souvenirs at the shops that sell miscellaneous products. They are located adjacent to the village—they are quite attractive and tempting your senses to buy some. You can purchase socks with thematic designs (such as flags, Winnie the Pooh, Mickey Mouse, Minie Mouse, etc). Keychains, scarves, and other fancy souvenirs for friends or families are available with fair rates. Please,note that you can get these not inside the village but just nearby and surrounding the area. Any time of the year is great for any visitor at the village. 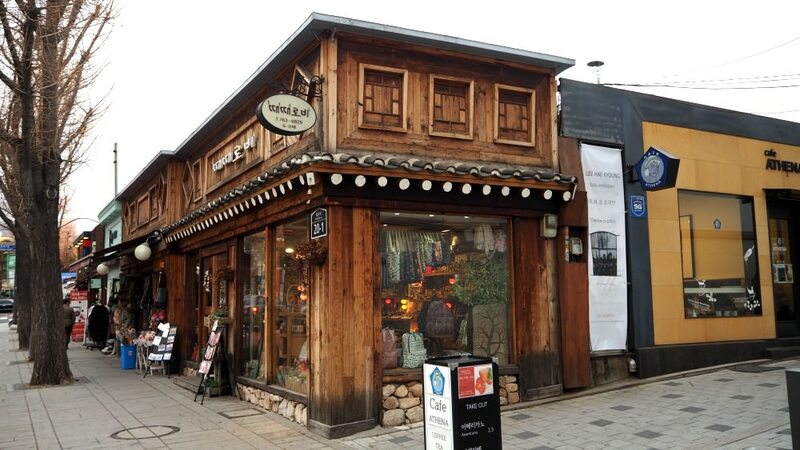 After your exploration, you can take time to try the local drinks, or simply sip in your favorite hot choco or cappuccino at the cafés located nearby the Bukchon Village. Hot or cold (iced) drinks are available. Of course, real juices or natural herbal and diet drinks are readily available if you ask for it. Certainly, you will never starve after your traditional culture experience at the village. There are many restaurants waiting for your curious taste buds. Maybe, you should decide first which food you wish to try and look for it. You can ask them to make it less spicy (or hot) if you want. To complete your traditional experience, there is nothing more conventional or cultural than eating local food. 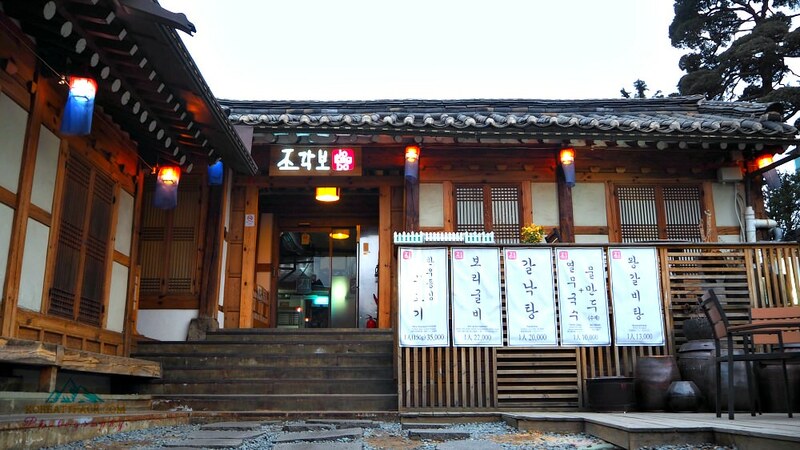 Now, if you want to complete your traditional Korean experience at Bukchon Hanok Village fully, you have an opportunity to stay for a night or a couple of days. (See one place below). The rates could not be more than you pay for a regular hotel. What you will get in a homestay is the service, cultural aspects, and hospitality of your hosts. This observatory located on a hill provides viewers some nice panorama of the area and Seoul’s environment. They offer drinks for free as you pay the entrance fee. Donglim Knot Workshop is a space producing, exhibiting, and educating various ornaments, wall mounts, and accessories suitable for contemporary costumes along with Traditional Knot. The center provides opportunities to learn traditional Korean crafts. The center has an experience room, display room, and an education room. They offer different arts each day during the week. Sample crafts: handkerchief dyeing, Tal (ornamental wooden masks), fabric ornament, ring-knot bracelet, silver gilded glass pendant, fabric mobile, gilded bookmark, hair ribbon, etc. Workshops are being held by Kim Gi-ho and Park Soo-young of the National Intangible Cultural Heritage on Guembakjang—Gold Leaf Imprinting. Thanks for reading this. Enjoy your traditional Korean experience soon!